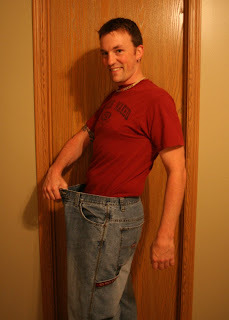 I took a picture yesterday illustrating the difference between my waistline now and my waistline back in August 2007. The pants I'm wearing in this picture (38-inch waist) used to fit snugly and would stay up without the assistance of a belt. Now, if I don't wear a belt, they fall right off of my hips. I've got to say, it feels good! Why am I telling you this? Because the place I work is having a pizza lunch today and I'm going to have a slice or five. The next picture I take will have me back in my jeans with no belt! Damn, you were up to a 38" waste! See, i can feel pride in a 38 because i used to be a 52! but, um, i never realized you were that big.